Click here for my recommended source of toppers. Jason offers one the industry's most complete selections with seven truck topper styles that fit most trucks. Each Jason cap includes an interior dome light, tinted safety glass, easy-lift gas door struts, a third brake light, a locking rear door, and an integrated fiberglass base rail system. All are back by Jason's limited lifetime Truck Topper structure and paint warranties. Jason truck caps add security, great looks and value to your truck. You can see all the standard and optional features for your Jason truck cap here. Lets not forget the gas mileage savings you'll get with a camper shell. Popular Mechanics has done the testing ... and ... the saving were 13%! Pretty impressive with today's high gas prices you can see it wont take long before you top pays for itself. Most people think the weight will decrease their mileage but actually by keeping the "parachute" drag of your tailgate out of the picture ...you will increase fuel economy because of aerodynamics. Add this little benefit to the good looks and funtionality and you've got a winning combination! Best of all worlds. Next ... add a few truck accessories and you'll be "turning heads". These very affordable caps deliver our superior quality along with great style and function. The Pace’s efficient good looks, reasonable price, and road-proven performance make it a great choice. 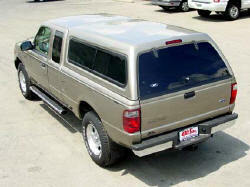 The Cab High Pace Series is available in a wide array of side window packages. See our catalogue for details. At JASON, everything we manufacture is custom made. We realize how important it is for you to have the "LOOK" you want on your brand new truck. You can be assured when you purchase a JASON cap it was built from start to finish with you in mind. The Pace is the best value in the industry.... Price and compare! Jason is a family run company based in Elkart Indiana and are always striving for improved customer satisfaction. Pickup Specialties has been very pleased with their level of manufacturing expertise.